Increased drought tolerance and improved nutrient absorption are two ways to improve agricultural energy efficiency and reduce the demand for energy intensive fertilizer production. Both of these features are directly related to the root system architecture - the shape and arrangement of roots in soil and thus can be improved by plant breeding for improved root systems. However, accurately measuring the roots of different plants is a major challenge. Laboratory methods limit the number of plants that can be easily studied, the size to which the plants can grow, and the type of environments to which the plants are exposed. Alternatively, field-deployable methods have the drawback that root measuring techniques require digging up the plant, which is labor intensive and prevents multiple measurements of the same plant. 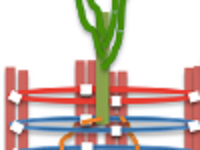 New methods to measure root system architecture in the field at different times in the growth cycle will help researchers identify which root structures lead to greater agricultural efficiency in biomass production for biofuels.